Question 1 What is a concave mirror? Question 2 What is a convex mirror? Question 3 Define centre of curvature? Question 4 Define the term pole? Question 5 Define the term aperture? Question 6 What is principal focus? Question 7 what is principal axis? Question 8 What is focal plane? Question 9 What is focal length? Question 10 Write Sign conventions for reflection by spherical mirror? 1)Concave Mirror:A spherical mirror whose reflecting surface is curved inwards ie faces towards the centre of sphere. 2)Convex Mirror:A spherical mirror whose reflecting surface is curved outward. 1)Centre Of Curvature(C):The centre of a hollow sphere of which the curved or spherical mirror forms a part. 2)Pole(P):The mid point of spherical mirror. 3)Radius of curvature(R):The radius of hollow sphere of which the spherical mirror forms a part. 4)Aperture:The part spherical mirror exposed to incident light or diameter of reflecting surface of spherical mirror. 5)Principal Axis:A line joining the Pole and centre of curvature of a spherical mirror extended on either side. 6)Principal Focus(F):A point on principal axis of a spherical mirror where the rays of light parallel to principal axis meet or appear to meet after reflection from the spherical mirror. 7)Focal Plane:A plane normal or perpendicular to principal axis and passing through principal focus of a spherical mirror. 8)Focal length(f):The distance between the pole and principal focus of a spherical mirror. 1)All distances are measured from pole of spherical mirror. 2)Distances measured in direction of incident light are taken as positive while distances measured in opposite direction are taken as negative. 3)the upward distance perpendicular to principal axis is positive while downward distance are negative. 4)Focal length and radius of curvature of concave mirror is taken as negative. 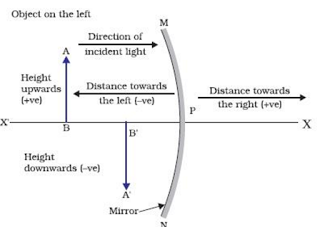 5)Focal length and radius of curvature of convex mirror is taken as positive.